HafcoVac offers the new ATEX EX Series vacuum. Designed to collect and control a wide range of combustible materials, it provides six times the suction of an electric vacuum without the risks of electric motor burnout. The ATEX EX Series is OSHA- and NFPA-compliant and ATEX-Certified in Class 1, Division 1, Groups A, B, C, D, T6 and Class 2, Division 1, Groups E, F, G, T6. 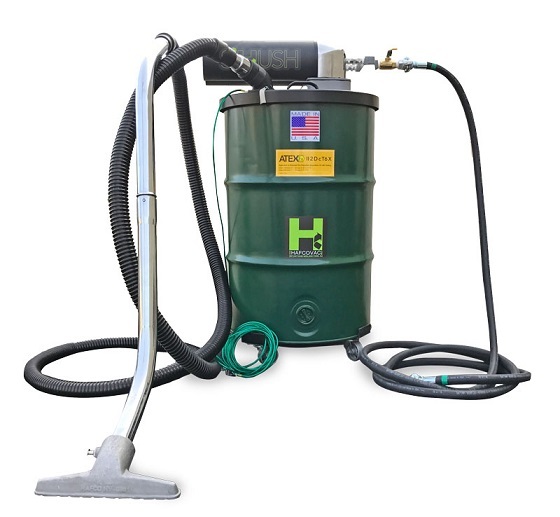 Powered by an air compressor, the ATEX EX Series is a complete, ATEX-Certified vacuum equipped with a Grounded 30- or 55-gal steel container, certified anti-static hose, 25-ft grounding cable, static conductive air hose, HEPA filter, floor tool and wand, and the new Hush silencer system that lowers sound levels to a safe 77dB.